For gardeners it is indescribably exciting when the bumblebees get moving, the pollen starts flying and the blossom on the fruit trees starts bursting in springtime. In this episode of the Stopwatch Gardener podcast, I’m looking at the mystery daffodil that baffled me for years before being identified by the friendly Duncan at Croft 16, and I’m indulging in early fantasies about the roses to come, the first of which will appear in May. 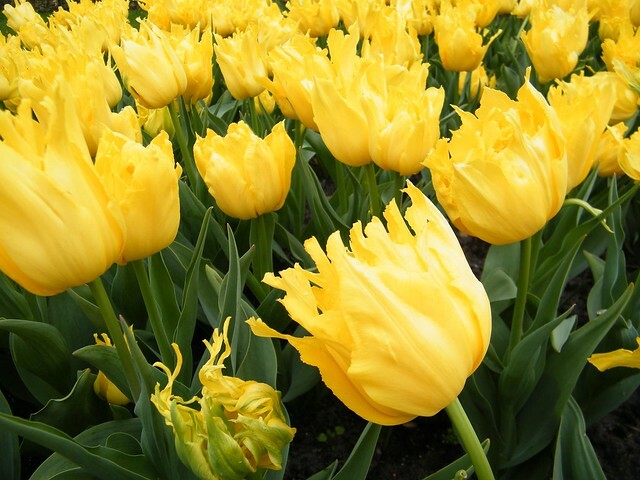 Keukenhof in particular, and the spring bulb fields of The Netherlands in general, should probably make it to the top of your to-do list if you’re as mad about tulips as I am. Picture a park-like garden, mostly consisting of spring bulb beds and shrubs planted among bright green lawns; now picture old deciduous trees just coming into leaf high ahead. The trees filter the light and the winding river and water features reflect the light here and there, giving the whole garden a rather enchanted atmosphere. Bulb fields at the perfect time: On previous trips, I don’t remember the commercial growers’ fields looking so stunning. 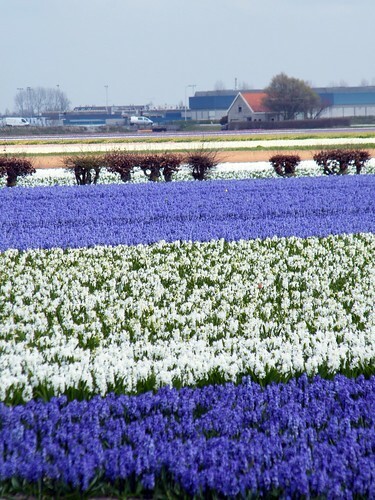 The drive into Lisse takes you past rainbow stripes of yellow, blue, red and pink; this year we were lucky to see the hyacinths, single early tulips and taller Triumphs just coming into flower. Previous trips brought me here in Week 1 and Week 3 of April; this time, Week 2 was perfect, although warmer or cooler springs will hugely affect what’s flowering when. Show-garden areas offering stealable ideas: I loved the Keukenhof ‘Inspiration’ gardens, something that may have featured in earlier years but which I’d not seen before (my other trips were with my newborn daughter and other family, and this was the first trip I had plenty of time to linger). Notice the clever use of trompe d’oeil in this girly pink garden — it has mirrors, empty frames suggesting mirrors, and double planters suggesting reflection. Love it! Another of the Inspiration gardens was this canalside deck, which at the back features raised planters that hold tiny espaliers of apple trees. The seating area is covered to keep out the rain and furnished with casually gorgeous, just-been-styled-for-a-Gardens-Illustrated-photoshoot elegance. 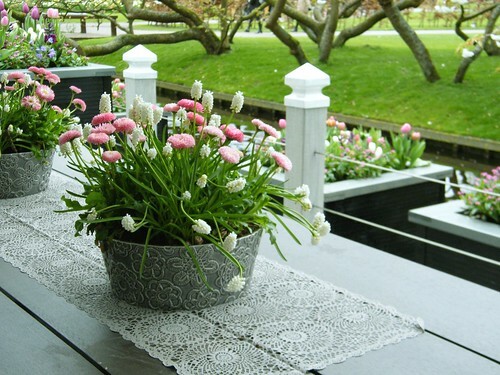 Look at this combination of muscari armeniacum album, with pink bellis daisies, along a lace runner over a simple gray wooden table. If this doesn’t conjure the illusion of effortless outdoor-living perfection, I don’t know what does. Large wooden planters at the canalside, some of which seemed to float over the water, hold a combination of dusky purple hyacinth, mixed tulips and anemona blanda. The joy of block plantings: Ingenious planting combinations at Keukenhof (crocus, chionodoxa, early and late tulips, alliums) are a particular strength of the place, showing how any garden can keep the interest going for 8 weeks in spring. However, I completely fell for this simple combination of Tulip Purissima and Tulip Flaming Purissima, which was repeated in huge rectangles all around the area around the central pavilion. The effect was full, sweet and feminine — like a bowl of strawberry ice-cream (a bride among the tulips looked perfect; I think she was a model on a shoot). Keukenhof always does this to me: it was here I first became betwitched by the Keukenhof ‘blue river’, the mass plantings of muscari armeniacum, and I ended up buying 900 bulbs to carpet a corner of our garden. (Thank God I didn’t get the ones that seed around freely; mine bulk up rather than seeding. I have muscari armeniacum Fantasy Creation, a gorgeous double; pots of this double muscari feature heavily in my Rare Plants for Rare Diseases sale next month). There’s something about Keukenhof that makes me crave mass planting on a grand scale, even if my garden doesn’t have the space for it. Isn’t it all a bit contrived and un-natural, those bulb beds? If you think a garden like this isn’t your thing, you may be surprised. 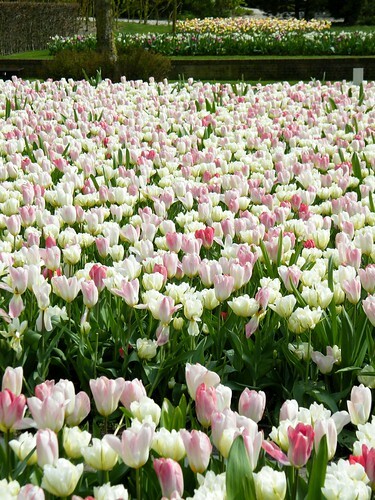 No, there’s nothing naturalistic about Keukenhof — “Oh, look, 350 hyacinths in a rectangle”; it’s enough to make Piet Oudolf spin in his grave if he were dead. As breathtaking as I find meadow-style plantings to be, I don’t believe that nor any other loose planting style is the only kind of garden beauty. Wandering amongst these spring bulb beds, with sun filtering through the breaking buds of the old oaks above, may not make you feel you’ve stumbled on something secret or half-wild. But its formality is wholly a part of its charm. 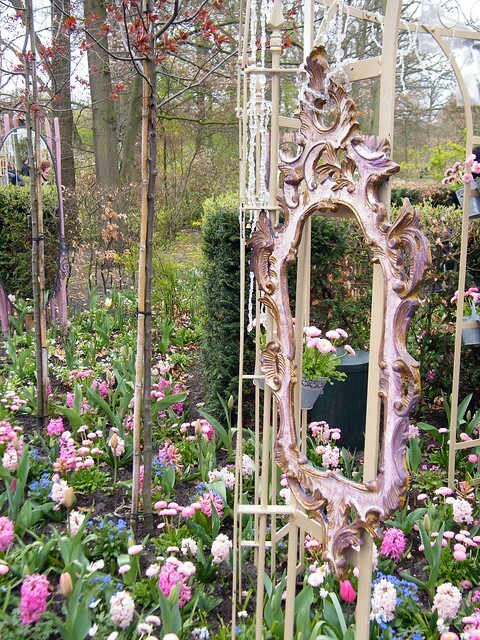 Exploring Keukenhof is like walking through a Klimt design or the contours of a Moorish mosaic: the artistry of the creators, and their mastery over their materials, is part of the wonder. Don’t worry unduly if you’re thinking of coming to Keukenhof but have limited mobility. Free wheelchairs can be reserved in advance and borrowed for a refundable deposit, and today I also discovered that for €10 non-refundable rental you can borrow an electric mobility scooter. Plenty of older guests get about the garden’s ample 32 hectares with this assistance; I had to use one myself for today’s visit, after badly injuring my foot a few days before. Do consider bringing a lunch or at least a hearty snack with you; there are plenty of benches and some picnic tables, and a packed lunch leaves you more money for the gift shop. Thanks, Keukenhof PR team for the press pass; my kids still had to pay, but as my husband was pushing my wheelchair, he came in on my pass. At €14.50 per adult excluding parking — and with children over age 11 paying full price — this is not a cheap outing. But you’re bringing your sandwiches, right? So there you go. Guilt-free and gorgeous. Go!